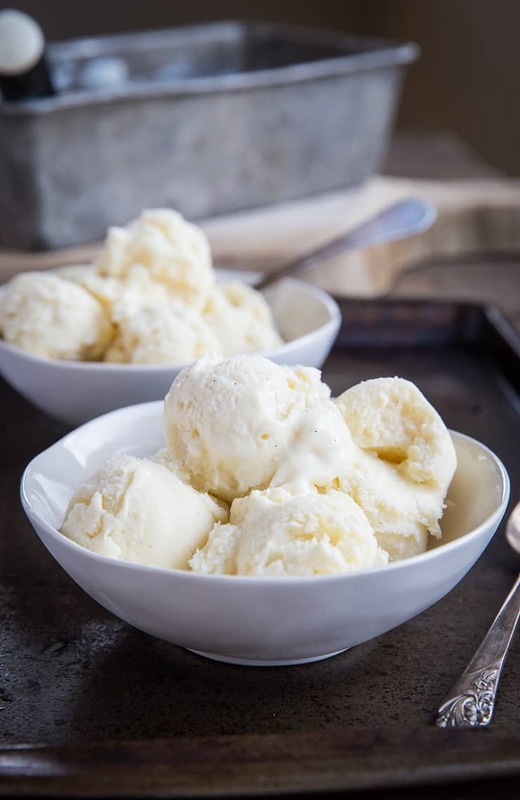 Low-carb keto ice cream recipe with lots of milk options and sweetener options to tailor the recipe to your diet. This easy recipe can be made with or without an ice cream maker. You guys, I made keto ice cream! Full disclosure before we proceed: I do not follow a ketogenic diet. I do eat low-carb for health reasons, but I’m not diligent enough about my macros to be keto. I have lived in and out of ketosis for a number of years and find it keeps me lean, balances my hormones, and boosts my energy like crazy; however, for me, keto isn’t a sustainable lifestyle simply because I like to having more freedom with my carb intake. In essence, if I find my way into ketosis by virtue of the fact that I eat a very low-carb diet, cool…but it isn’t something I strive for. What is sustainable for me? Ice cream that won’t spike my blood sugar. That, I could eat every.dang.day. Let’s back up a tick. If you aren’t familiar with keto and you want to know more, read my post on What is Keto and is it Right for You?. 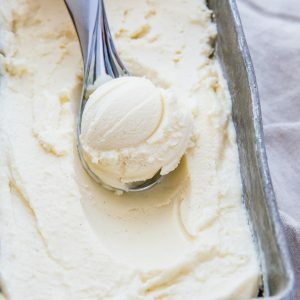 If you’re like me and you can destroy a pint of Halo Top in a nano second, this recipe for vanilla keto ice cream was created in your name. Throughout the post, you’ll get a sense for how to make low-carb ice cream using ingredients that fit whatever lifestyle you follow. 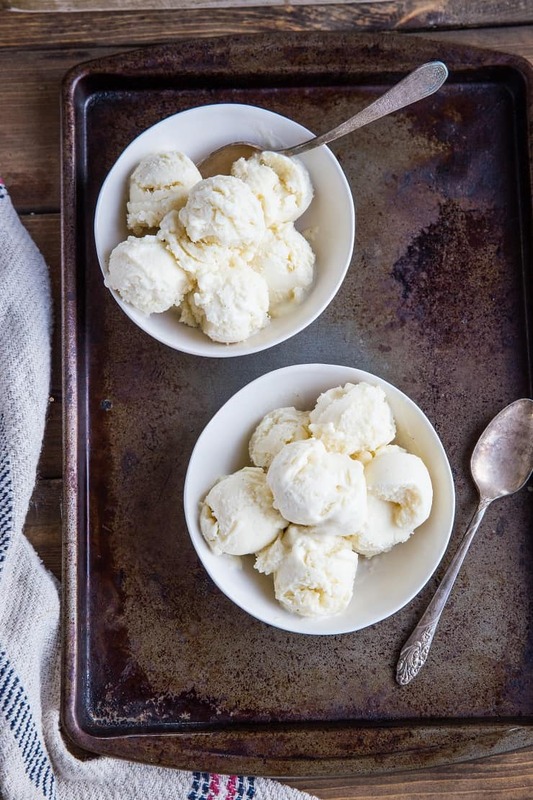 So how do we make low-carb, keto ice cream? The basic formula is: a low-carb milk + zero-sugar sweetener + egg yolks + beef gelatin. This combination yields the creamiest, dreamiest ice cream that beats store-bought every dang time! Simply heat everything up on the stove top in a saucepan. You want the mixture to barely begin to steam, but not come to a full boil. Once heated, transfer the ice cream custard base to a large glass container and refrigerate until chilled. 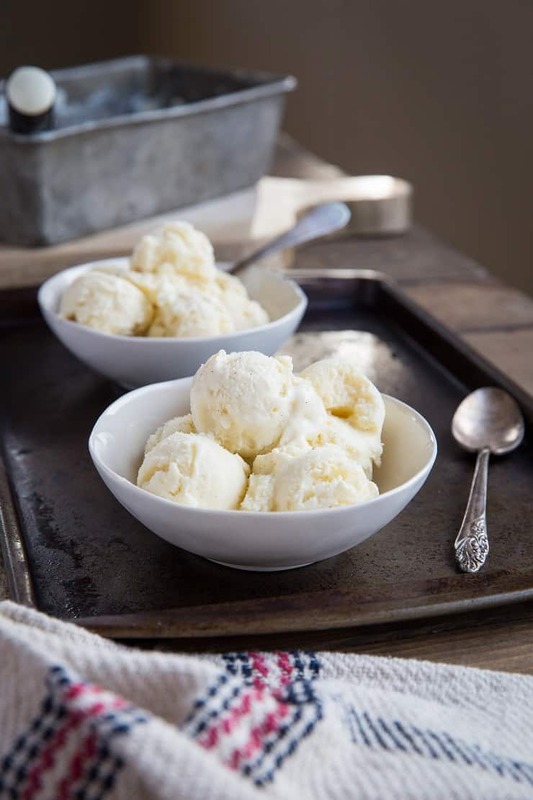 Once chilled, transfer the vanilla custard to your ice cream maker and churn! Do note: If you allow the mixture to chill completely, it will become very thick and coagulate (almost like flan or thick pudding). This is normal! You’ll simply stir this mixture very well before adding it to your ice cream maker. Trust me, it will work. From this base, you can create a multitude of other flavors. Just be careful to pay attention to the carbohydrate content of anything else you add to make sure the ice cream maintains the macro profile you’re looking for. I’m going to get into the nitty gritty of how you can customize this ice cream recipe according to your desired carb v. fat intake. There will be talk of calories, which I usually avoid with all my might, but it’s relevant to this post, so we’re going to dive right in. Okay you guys, here’s where the adventure begins. You get to choose which milk to use according to your dietary needs. If you’re a low-carb eater, you can get away with using whole milk or half & half, so long as you’re cognizant of the rest of the carbs you’re taking in throughout the day. If you’re strictly keto, you will want to stick with heavy whipping cream, which contains only a tiny amount of carbs – 6.5 grams per 1 cup. BUT a lot, a lot of fat (and calories). If you’re keto, you can still go with the whole milk or goat milk version (more on that in a few paragraphs), you’ll just be eating up much of your carb intake, which in my opinion should be reserved for foods that are more nutrient-dense (i.e. your veggies). This brings us to the low-carb v. fat debate. Are you fine with higher fat so long as the ice cream is low-carb, or are you okay with a moderate (I’d argue still low) amount of carbs with less fat? When you use heavy whipping cream to eliminate carbs, you’re amping up your fat intake big time, along with calories. If doing so is built into your diet plan, proceed forth. Just know that one 1/2 cup serving of ice cream with heavy whipping cream contains 421 calories, 50 grams of fat, 0 grams of carbs, and 1 gram of protein. Again, if this is something that doesn’t concern you, awesome! If you’re simply trying to stay away from excess sugar, the whole milk version may be the best way to go, as it contains around 125 calories per serving (I consider one serving to be 1/8 of the recipe, which is over 1/2 cup of ice cream), 13 grams of carbs, 5 grams of protein, and 6 grams of fat – this is a similar macronutrient profile to Halo Top. You’re getting a super rich and creamy ice cream with a small amount of carbs compared to your standard ice cream. The downside is, for many people on keto, one serving of this ice cream takes up the entire carb content they can eat for the whole day. So what have I been doing? I’ve been using goat milk. I eat a lower-carb diet because my body doesn’t do well with most forms of carbohydrates, but I’m nowhere near keto, so for me the heavy whipping cream version is simply too aggressive. I tend to process goat milk better than cow’s milk, so I’ve been using whole (vitamin D) goat milk and love the way it turns out. The goat milk version is 98 calories per serving (again, I consider one serving 1/8 of the recipe), and 6 grams of carbohydrate. There’s also 7 grams of protein, and 5 grams of fat which is a pretty fabulous macro spread if you ask me. Are you keto and dairy-free? You’ll want to go with the coconut milk option, which let me just say, is one of my personal favorites. The coconut milk version of this recipe is 228 calories per serving, 1.5 grams of carbs, 4 grams of protein, and 21.5 grams of fat. Just like sourcing your dairy, be sure to source your coconut milk wisely. I always go with organic coconut milk with no added emulsifiers because gums bother my digestive system, but if your body does find with starches and gums, you can be more lenient with the type of coconut milk you use. If you are less concerned about how insanely rich your ice cream is, you can dabble with other milk options such as almond milk or cashew milk, or incorporate blended soaked cashews into the ice cream (just like you’re making vegan cheesecake ). Again, know that using nuts and nut-based milks will add carbohydrates to the ice cream, so be cognizant of that if you’re keto. All of the above mentioned options yield incredibly creamy ice cream that will drive your taste buds bonkers. My personal preference when it comes to zero-sugar sweeteners is Swerve. I’ve found some sugar alcohols to be unfavorable to my digestive system, but Swerve seems to do just fine! For me, Swerve tastes closest to actual sugar without that sugar alcohol flavor. Other great sweetener options are Stevia, Monk Fruit Sweetener, Erythritol, and Xylitol. How much sweetener should you use? That’s entirely up to you. All the above options have zero calories, zero carbohydrates and zero sugar, so theoretically, you can sweeten to your heart’s delight without a blood sugar backlash. I personally prefer my sweets to be less sweet than your standard dessert, so I only use 1/3 cup of Swerve. If you were to aim for standard ice cream sweetness, you’d be using closer to 1 cup or even more. The only issue I have with the amount of sweetener used is I find at a certain point, it becomes wonky on my digestive system. If you’ve been around the sugar alcohol block a time or two, you know exactly what I’m talking about. If you’re new to low-carb or keto, start small and work your way up to give your body time to adjust. What’s the deal with beef gelatin? The function of beef gelatin in this recipe is to help emulsify it into custard-y bliss. I use Vital Proteins Grass-Fed Beef Gelatin which is flavorless and works like an absolute charm. You can also use agar for a plant-based gelatin, although agar does contain a small amount of carbohydrates. Can you make the ice cream without beef gelatin? Yes. You can omit it altogether and still end up with a delicious ice cream, it just won’t be quite as soft and creamy. Beef gelatin is also packed with protein, collagen, and is amazing for your digestive health. In essence, not only does it make your ice cream super thick and creamy, it also gives it a nutritious boost. Because beef gelatin thickens and coagulates liquid, you will notice as your ice cream base cools in the refrigerator, it gets very thick. So what is my opinion on the best recipe for low-carb ice cream? The goat milk option has the best macronutrient profile for me personally…it is low in calories and carbohydrates, high in protein, and lower in fat. PLUS you aren’t sacrificing any of the richness…it turns out CRAZY rich! Is it technically keto? Yes and no. Yes, because it’s under the amount of carbs you need for the day when on keto (which for sedentary people is around 20-30 grams).. but realistically, no because I’m assuming you’re going to want to get more of your carbs from vegetables rather than ice cream. Can you taste the goat milk? Yes, but not overwhelmingly so. To me, it just has the slightest tang (kind of like frozen yogurt), which I enjoy. If you can’t hack the goat milk, in my opinion your next best option is whole cow’s milk…again just be sure you’re okay with the carb content (the 13 grams of carbs per serving may be the only carbs you can consume for the whole day if you’re strictly keto, so obviously you’re going to want to get those carbs from more nutritious whole foods). If you’re going for ketones here, obviously you’re going to want to stick with the heavy whipping cream route. In order to keep this recipe truly keto and not cause any unnecessary stress from the keto diehards, I have the heavy whipping cream version in the recipe card and have added the other milk options to the notes. If you don’t own an ice cream maker, no big deal! This recipe will still turn out amazing as a no-churn ice cream. Simply skip the ice cream maker and freeze the ice cream base in a freezer-safe container until it’s frozen. Viola! No churn ice cream. Every time I make ice cream, I’m asked which ice cream maker I use. I use the Cuisinart Pure Indulgence 2-Quart Ice Cream Maker. I’ve had it for over 5 years, have made countless batches of ice cream with it and absolutely love the way the ice cream turns out! Depending on the flavor you’re going for, you can absolutely go with or without a vanilla bean. 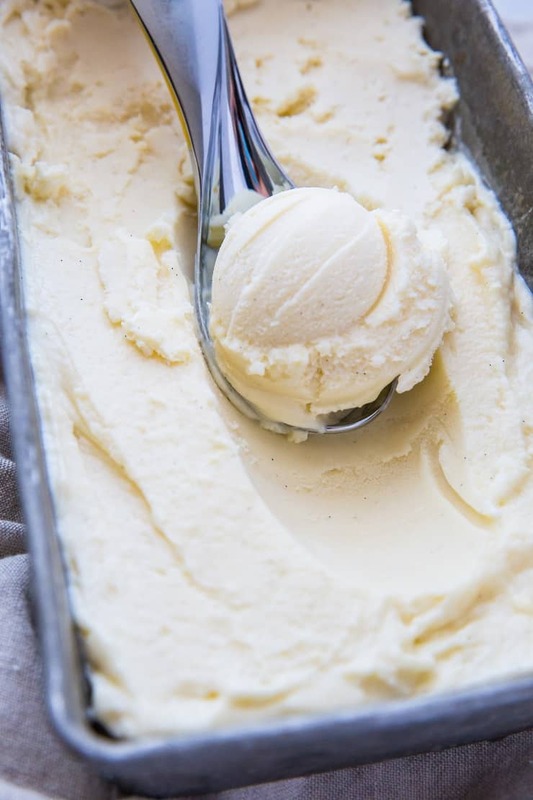 You’re already putting two tablespoons pure vanilla extract in the ice cream base to make it nice and vanilla-y, yet adding a vanilla bean adds an extra depth of flavor. If you don’t keep vanilla beans on hand, don’t sweat it! Just be sure you use a high quality pure vanilla extract like Nielsen-Massey or Frontier. So! Low-carb ice cream? You guys can go wild with the possibilities. Just be sure you’re choosing a milk that works best for you. I’m always a major proponent for choosing organic and paying attention to any additives. 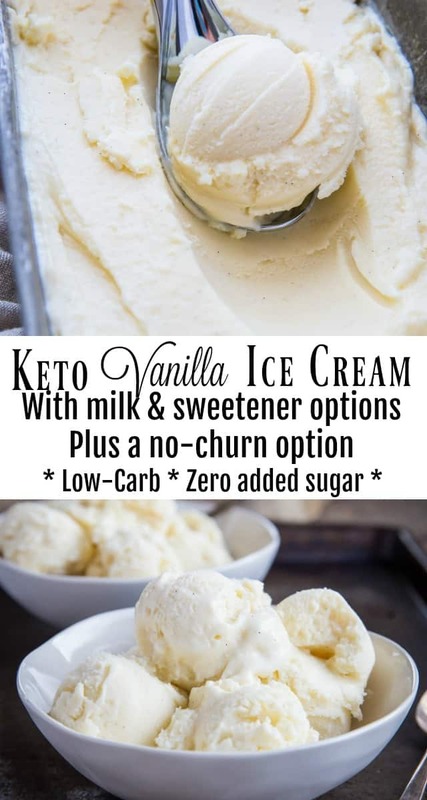 Use this keto ice cream recipe as your base for all your low carb ice creams! Consider adding protein powder, cocoa powder, mint leaves and mint extract, matcha powder, and other ingredients that won’t spike the carbohydrate content but will boost the flavor to your liking. 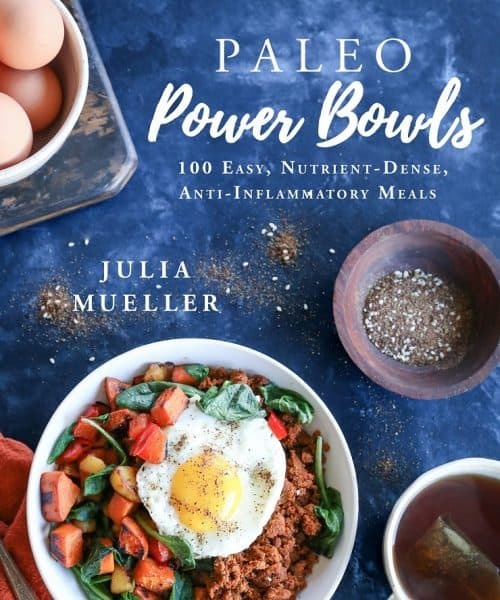 My cookbook, Paleo Power Bowls, is now available! CLICK HERE to check it out, and thank you for your support! Go get your cream on! 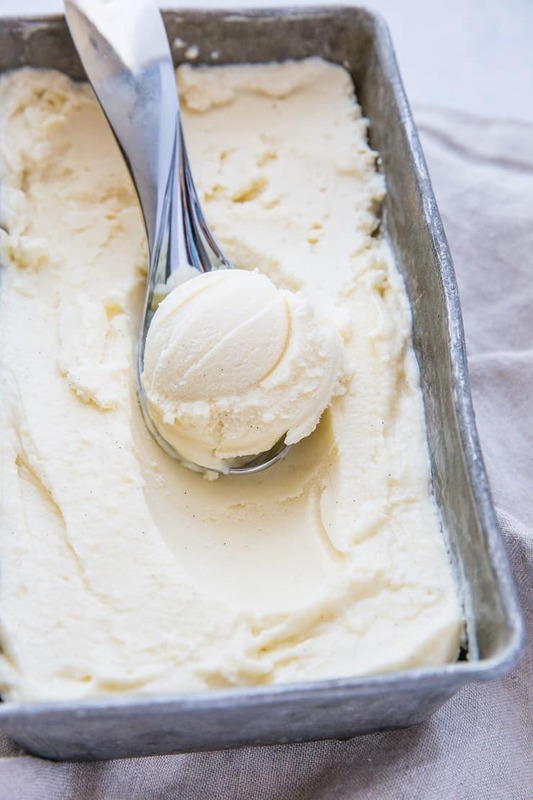 Creamy low-carb vanilla keto ice cream made with just a few basic ingredients. A no-churn option included so no ice cream maker necessary! Place the bowl of your ice cream maker in the freezer and freeze overnight. Note: if you don't own an ice cream maker, no big deal! You can still make this recipe. Add all ingredients to a medium-sized saucepan and whisk well. Note: be sure you open and scrape the vanilla bean into the mixture prior to adding the full bean...this way you get a great deal of vanilla flavor out of it. Place the saucepan on the stove top and heat to medium. Cook, whisking consistently until mixture is beginning to steam but does not reach a full boil. Remove from heat and allow mixture to cool before transferring it to a sealable container. Refrigerate at least 2 hours, or until completely chilled. Stir the ice cream base well and pour it into your ice cream maker. Turn ice cream maker on and churn until very thick and creamy. Serve immediately for soft serve consistency or for an ice cream consistency, transfer to a sealable container and freeze for at least 2 hours. Note: if you don't own an ice cream maker, simply transfer the base to a freezer-safe container and freeze 4 hours or until completely frozen. Allow ice cream to thaw before scooping and serving. *Replace heavy whipping cream with whole milk, goat milk, or full-fat canned coconut milk according to your dietary needs. **Sweeten the ice cream according to your personal taste. I only use 1/3 cup and find it plenty sweet. I suggest using Swerve (this is what I use), Stevia, or Monk Fruit Sweetener, but you can use any of your favorite zero-sugar sweeteners. Nutrition facts are calculated based on the heavy whipping cream version of this recipe. Disclosure: This page contains an Amazon Affiliate link. If you purchase a product through this link, your cost will be the same but I will receive a small commission. Thanks for your support! Would you tell me how I can use this recipe and make espresso ice cream instead of the vanilla? Hi Ellen! No problem! All you need to do for an espresso version is add 3 to 4 shots of espresso to the ice cream base (or custard) after it comes off the stove, before you put it in the refrigerator. I personally would still leave the vanilla extract in, but that’s just me. Taste the ice cream base for flavor after you add espresso and you can always add more if it isn’t espresso-y enough for you. Hope you love it! In agreement here for loving Halo Top Ice Cream. I really appreciate the recipe and info. Just an fyi, though… there are carbs in Heavy Whipping Cream EVEN THOUGH the ingredients state there are zero carbs. This falls in a tricky loophole where if it is under a certain amount, “they” are not required to report it on the ingredients. One of the many, many ways we are being deceived! I’m glad someone noticed this other than me! Very misleading. 1c of HWC has about 6.5 carbs, but the nutritional information shows zero carbs for the 1 tbsp. serving size. I would be more concerned about the calorie and fat content in 1 entire cup of heavy whipping cream than 6.5 grams of carbs. But that’s just me. Is there an alternative to using egg yolks? I do not feel safe consuming raw eggs. Hi Ali – the eggs aren’t raw. If you read through the instructions, you’ll see they get cooked :D. If you want to omit them altogether, you definitely can…the ice cream will just be less custard-y. Oh my goodness, oh my goodness, oh my goodness! Julia I would give you a big hug right now if I could. I discovered keto dieting earlier this year and jumped in with both feet. After spending countless hours scouring the internet and ordering tons of expensive keto this and that ingredients (with high expectations of the weight magically falling off daily) I sit here only 6 pounds lighter after my four months of effort. I have tried various keto ice cream recipes that just haven’t ticked off all the flavor and macro boxes that satisfy me. I am definitely excited about making your ice cream recipe. Can you tell me which brand you use and where to buy it? Have you thought of cutting out dairy? I tried twice and struggled to lose on Keto until my 3rd attempt at Keto where read that dairy can cause a plateau. I cut almost all dairy (I still have butter and heavy cream) and the pounds melted off. By month 4 I had lost 28lbs and now in month 7 I’m down almost 50lbs. 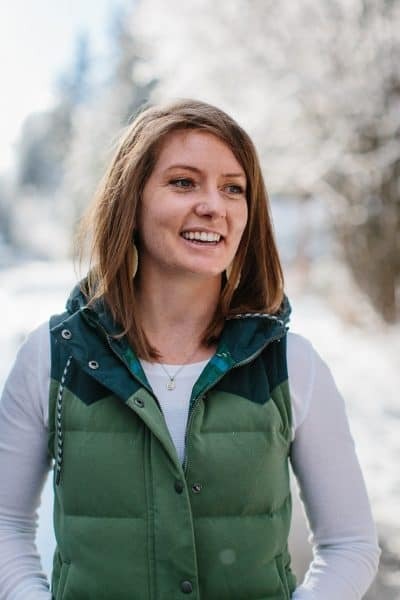 I have autoimmune thyroid disease so weight loss is usually especially hard, but cutting dairy worked, and my endocrinologist can barely believe the results. Ooopsie, silly me, I meant to ask which brand of goat’s milk you use. Is the swerve you’re using granular? Or confectioners? Or does it matter whether it is granular or powdered flr any sweetner besides swerve. Hi Jess! I use the granular Swerve, but you can use any type of granulated zero-sugar sweetener (some folks like using Stevia or Monk Fruit Sweetener). Let me know if you have any other questions! My batch of ice cream turned out really gummy. this is the first time i’ve used gelatin in a recipe (powdered form). Maybe i should decrease the gelatin next time? It’s normal for the ice cream base to be very thick and custardy before it is churned and frozen, although it shouldn’t be gummy when it’s frozen. I would use a little less gelatin on the next batch (say 1-2 tsp) and see if that helps 🙂 Hope you enjoy! I made the other night, and it is amazing!!! I posted on Instagram (which you saw, thank you! ), And I split it into two containers. In one, for my daughter who needs actually to gain weight, I made little teeny chunks from a refrigerated sugar cookie dough. She loves cookie dough ice cream but doesn’t like chocolate, so I made something that doesn’t actually exist commercially and she loves it! For the hubby and I, I put Lily’s Stevia sweetened dark chocolate chips and chopped roasted hazelnuts. It is So Good!! The only thing I changed is for the sugar substitute, I used 1/4 cup xyla, and 1/4 cup swerve granulated. It is amazing, and far better than Halo! Thank you so much for this recipe! I made the recipe exactly as posted above with a little more than 1/3 of a cup of monk fruit sweetener. I had to recheck 2-3 times to make sure I used the appropriate amounts of everything. The gelatin turned into to a gelatinous glob. I tried to freeze it without churning it, as there was no way it would churn. It had the consistency of bread pudding, rather than ice cream. Why the gelatin? Couldn’t you just add a couple more eggs, make a traditional custard and churn it, just like you would regular ice cream? It would still be Keto. I will try again using 1 teaspoon of the gelatin, rather than 4, to see if that gives it a different consistency. But, I had to throw it out… inedible. And it clogged the drain a bit because it was too dense. I’m so excited I found this! Just got a Cuisinart ice cream maker for Christmas. I’ve never made ice cream before. I used a recipe from the small booklet that came with it and replaces milk and sugar with cream and sweetener, and I added the gelatin. I cooled for 4 or so hours in fridge before putting in ice cream maker. It was done in under 5 minutes as the misfire started freezing to the inside of the machine. I scooped it out but the frozen layer is stuck until it thaws. Do you know if Is this normal or did I do something wrong? Thank you so much for your recipe and time! Was the layer of stuck ice cream very thick (say thicker than 1/4 – 1/2 inch)? It’s entirely normal to have a layer frozen to the side of the ice cream maker, but if it’s super thick, then I would say there is an issue with the maker 😀 Hope this helps! The ice cream won’t turn out very well using almond milk. You really need fat content from either full-fat coconut milk or a high-fat dairy option in order to get the richness and smooth texture. You can definitely skip the beef gelatin and still get a great ice cream, but skipping a high-fat milk option won’t yield a very tasty result unfortunately. I hope this helps! Thanks! That’s what I figured, but I only had two cups of heavy cream. I went ahead and mixed the cream with almond milk at a 1:1 ratio cause I was too excited to try your recipe to wait till I make it to the store. I’ll try it tonight and see how it turns out! This should be heavily edited as it’s misleading. Heavy whipping cream DOES have carbs!! This looks delicious! I calculated about 32.8 carbs for the entire recipe. But you state 4 servings. I was wondering how many scoops one recipe makes? Ok. Thank you! Making it tonight!! Hi! I made your ice cream. On that first day it was delicious. Even after about 3 hours in the freezer I could scoop it out beautifully. But the following day it as as hard as rock and came out in chunks. What did I do wrong? Is it just a madder of leaving it out for 30 minutes every time I want a scoop? It could be from thawing it and re-freezing..when it thaws, does it soften back up? Thank you, Anna! I hope you enjoy! Let me know if you have any questions. Hi! Do you have a net carb content for this ice cream based off your basic ingredients? One more question! I don’t have an ice cream maker so I cooked it on the stovetop. I used your recipe exactly, and it tastes more like a frozen custard. Did I do it correctly?